Today, I bring you a special blog post. 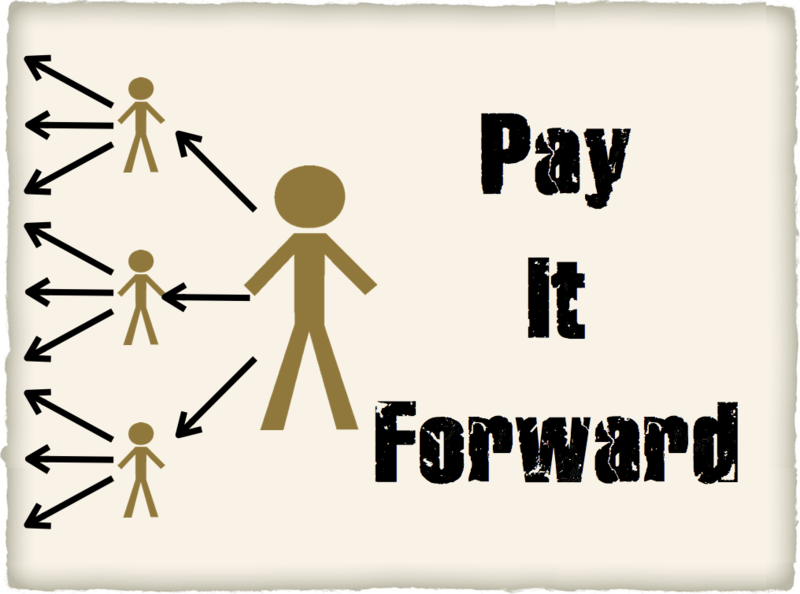 April 28th marks International Pay It Forward Day, observed now in 28 countries around the world. You might have seen the movie, made popular by Kevin Spacey and Haley Joel Osment. If you haven’t, I highly recommend renting, even buying it. So, what is this all about? It’s simple – pay it forward. That means help someone by doing something nice, expecting no personal gain. You’ll gain something – the best feeling ever because you brightened someone’s day. When you’re in line for coffee, buy the next person’s cup. Help carry someone’s groceries to their car or load them up for them. Leave a well thought out comment on someone else’s blog post and don’t link to a post of your own or your blog. Share useful advice and knowledge gained with others. Tweet articles from others more than you promote yourself. Help a job seeker by referring them to someone in your network. Smile. Smile at everyone you meet or interact with, even if it’s just in passing. I’m excited to announce that next week, I won’t be blogging here on Campus to Career. What? Did I just say that? Yes. My good friend, Kate-Madonna Hindes (@girlmeetsgeek) will be taking the reins here, sharing her insight with you. She’s graciously agreed to let me guest post on her blog, GirlMeetsGeek, so we’ll be swapping posts. Katie and I also blog together on the JobHuntChat blog. While you’re waiting for her awesome post that will launch next Tuesday, May 3, check out her site. I think you’ll like it. If you do, share it with your friends. Don’t keep the good stuff to yourself! Pay it forward. Until next week, keep on rockin’ the job search!